Blisters, particularly friction blisters, are incredibly common, and just about everyone will suffer from a blister at least once in their life. Friction blisters develop when your clothes or shoes incessantly rub against your skin with a bit of pressure, causing a burn. A blister will then develop as a result of the outer layer of skin separating from the inner layer, and lymph fluid fills the space in between. Blisters of this nature can be rather discomforting and even so painful it hinders the ability to walk. Shoes that don’t fit well, and even some that do, can cause friction blisters. What Are the Common Causes of Blisters Between Toes? They can be caused by many different things. While blisters can be very uncomfortable, they are not likely to cause any permanent damage. Blisters can form as a result of you having an allergic reaction to an insect bite. Polyester socks may also cause blisters if you have an allergy to polyester. A fungal infection like athlete’s foot can also cause blisters between toes. Athlete’s foot will make the skin between your toes red, cracked, and blistered. You may experience burning or stinging sensations around your toes, which is a sure sign of athlete’s foot. Ill-fitting shoes are a common cause of blisters. Particularly shoes that are very tight in the toe area, as it will encourage your toes to rub against each other and create friction, causing blisters. Itchy blisters between toes are usually a sign that your shoes are too tight. When your skin is hot and sweaty, moisture can get trapped in between your toes, making it a breeding ground for blisters. Athletes suffer from blisters that are caused by excessive sweating, and so do people who have to wear one pair of shoes for an extended period of time. Smaller blisters with not much fluid inside can be left as it is. Underneath your skin is a clean environment, and puncturing the blister could cause bleeding and other problems. The same goes for blood blisters. Puncturing a blood blister will put you at risk of getting bacteria in your bloodstream. You can separate your toes and help relieve pressure on small blisters with gel pads, spacers, or medical grade lamb’s wool. Keep the webbed space between your toes clean by washing it with soap and water, and drying it with clean tissue. Soaking your feet twice a day in a mixture of white vinegar and Epsom salts is also helpful. Large blisters should be drained. If they are left to grow, they will be painful and could burst on their own. To drain a blister on your own, make sure your hands are clean and sterilize a needle with rubbing alcohol. Old practices involves sterilizing the needle with fire, but it is now advised against, as carbon particles can get into your skin and aggravate the wound. Puncture the blister with the needle and use your fingers to gently squeeze out the liquid inside. Do not pick the skin off around your broken blister, as it is a protective barrier for the raw skin underneath. Apply antibiotic cream to kill bacteria, and take care to wrap your blister with a tight bandage to keep it clean. Keep an eye on your wound, and take note of strange fluid that may be white or yellow in color. This, and red streaks, or warm skin around the wound may be a sign of infection. The astringent properties of aloe vera gel are great for soothing your wound, and can help prevent against infection. Remove the bandage periodically and have an epsom salt soak. Put a new bandage on after soaking, and keep a bandage on until the skin starts healing. Keep your feet clean and dry, and use an over-the-counter antifungal cream. It’s important to take care of your toenails and keep them clean and short, especially before running or hiking. The nail should come just to the tip of the toe, but no further, and should be cut straight across (which prevents ingrown toenails). Keeping your toenails short will help you avoid pressure from constrictive shoes, and walking on a decline. If you’re hiking or running, or just out for a long stroll, take five and let your feet air out to dry. Drying your sweaty feet periodically will prevent against fungal growth. You can reduce the swelling of your feet by elevating them on your break as well. Using a callus file along with skin softening creams can help with problematic hard areas. Creams also help with the cracking and fissures that are often found on the heels. If a blister develops beneath a callus, it can be very difficult to drain and care for it. You can find gel or foam spacers/wedges in a pharmacy, or maybe in a podiatrist’s office. These wedges are soft and very comfortable. They are held in place just by the surrounding toes, so it’s not uncommon for them to become dislodged. The spacers absorb a lot of pressure so that your toes don’t have to. Toe taping can protect your toes from rubbing together. There are many different techniques and brands of tape you can try, Fixomul, Rocktape, and Leukoplast to name a few. Keep in mind that sweat wears on the adhesion material and can cause your tape to stretch and come loose, which means reapplying several times a day. Toe socks are great for extra cushion between toes. 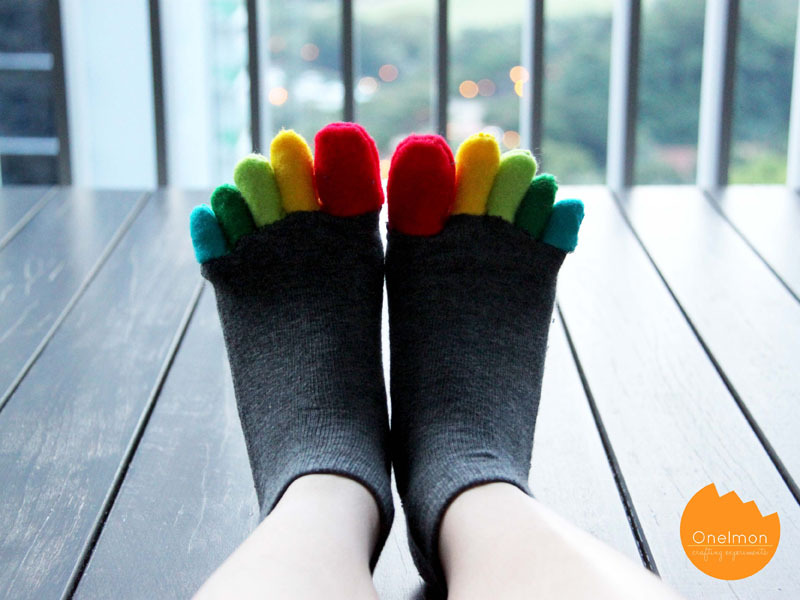 These socks are designed with an individual ‘sock’ for each toe, which helps prevent against blisters between toes. The downside, however, is that these socks can be quite bulky for shoes. If you choose toe socks, make sure your shoes have enough room inside so as not to create more pressure. Wash your feet well every day, and dry your feet thoroughly with a clean towel. Make sure to dry in between your toes before you put clean socks on. Putting socks on wet feet is not a good idea, as it helps fungus grow.